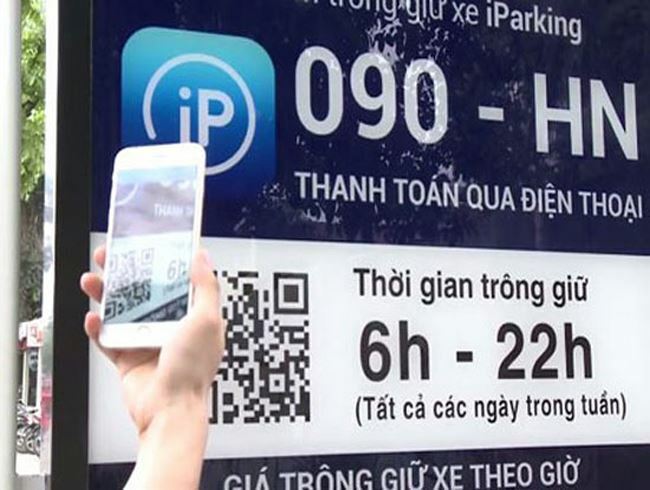 PSNews – IParking, a smart parking application, was launched from January 1st in 9 urban districts of Hanoi, according to the Hanoi Parking One Member Co., Ltd. The 9 urban districts include Hoan Kiem, Dong Da, Hai Ba Trung, Ba Dinh, Tay Ho, Thanh Xuan, Nam Tu Liem, Long Bien and Cau Giay. In addition, according to Decision No.44/2017/QĐ-UBND issued on December 15, 2017 by the Hanoi Municipal People’s Committee, from January 1, the parking fee is VND 25,000 for the first 2 hours and is raised from the third hour. iParking is the first app in Vietnam to help drivers search for parking slots and payment via smartphones. With the iParking app, users can register multiple vehicles under one account and select the parking lot easily by scanning the QR code at the parking place. The application will also inform users 15 minutes prior to their parking time expiring and offer them options of extending their parking periods through their smartphones.